Stephen Jaenchen, the owner and founder of what is now Summit Cleaning Services, began carpet cleaning in Milwaukee, Wisconsin in 1984. He purchased a portable machine later that year and began, "Steve's Incredible Cleaning" to help work his way through college at Bethel College and Seminary in St. Paul, Minnesota. In 1992, Stephen moved to Santa Barbara and worked for several reputable cleaning establishments there until 2001. While there, Stephen became the operations manager for Star Rug Cleaners and had the opportunity to grow in his knowledge and experience in the care of fine, custom rugs. He also had opportunities to work for a number of notable individuals, including Carol Burnett, Paul Hogan, John Cleese, Steve Martin, Gina Davis and Robert Zimeckis. Shortly after marrying Ruth in 2000, the couple moved to Carson City in 2001 and Stephen worked for Summit Carpet Care in Incline Village as their lead technician and operations manager. 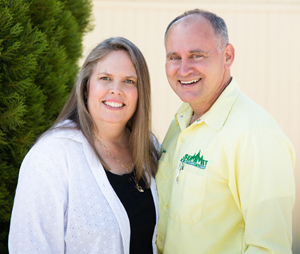 In the fall of 2003, Stephen and Ruth began, "A Better Carpet Cleaner" in the Carson Valley to provide a higher quality service than what was available to the area. With Stephen working as the cleaning technician and Ruth handling phones, scheduling, correspondence, marketing design and administrative support, the company began to flourish. In 2004, they purchased "Summit Carpet Care" from the previous owner. Over the next five years, Stephen and Ruth worked to educate themselves further with Ruth attaining her "Carpet Cleaning Technician" certification and Stephen attaining one of the IICRC's highest level of certification, the Master Textile Cleaner in 2006. As their reputation and the demand for their services grew, the couple decided in 2007 to grow the company further and they hired additional staff to help with cleaning and administrative operations. To further facilitate their growth, the two names were merged into "Summit Cleaning Services" in December, 2011. Ruth and Stephen joined Howard Partridge's "Inner Circle", a business development group associated with the Zig Zigglar organization and systems were put into place to help ensure that their mission "To create smiles by providing the most outstanding service experience ever" would be delivered consistently to their clients. In 2012, Stephen published the book, "How to Avoid Nightmare Carpet Cleaners" to inform the public about unscrupulous cleaning practices in the industry, and how to avoid them. Summit Cleaning Services now employs five people, and is looking forward to opening up a state-of-the-art rug cleaning plant in late 2014. They continue to be the industry leader in Northern Nevada for professional carpet, rug, upholstery, leather, stone, tile & grout and wood floor care services, boasting a Better Business Bureau A+ rating, the Angie's List 2013 "Super Service Award," and an unprecedented (and documented) 98% client approval rating. Summit Cleaning Services now provides donated services to several local charities and organizations, including cancer patients of the Carson Tahoe Cancer Resource Center and the Nevada Children's Museum, along with discounted rates for a number of area churches. We hope to continue and even expand our reach into the community by providing exceptional employment opportunities for our staff, to provide outstanding service experiences for our clients, and to help other local businesses succeed in their endeavors.